Pousse-Pousse is a comedy that tells the story of a scooter-driver who wants to marry Rose and buy a car. 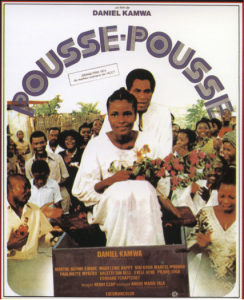 Pousse-Pousse ends up using all his savings to pay the traditional dowry to his demanding future father-in-law, Daddy Besséké who takes excessive advantage of this custom. Daddy Besséké's greed knows no bounds - he demands more and even kidnaps his own daughter on her wedding day.